My first dive trip to the Maldives was to the island of Bandos, a good all-round resort island very near Male airport and with dive sites only a few minutes boat ride away. During March 2008 I spent a week in the Maldives on the island of Bandos. Bandos is one of the Maldives’ oldest and biggest resorts, located a twenty minute boat ride from the international airport in Male. (You can read more info about Bandos’ accommodation and restaurants here). 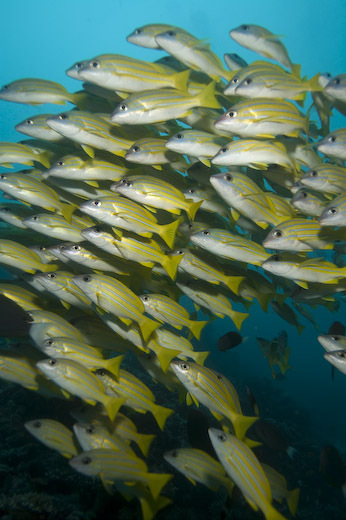 Despite Bandos’ proximity to the nation’s capital and the heavily developed (and in some case industrialised) islands around it, the diving around Bandos is really quite impressive. It’s certainly the easiest access I’ve ever had to diving this good – get on the plane in Bangkok, get off in Male after a four hour flight, get on the taxi boat, arrive at the resort 20 minutes later, get in the water first thing in the morning – bingo! 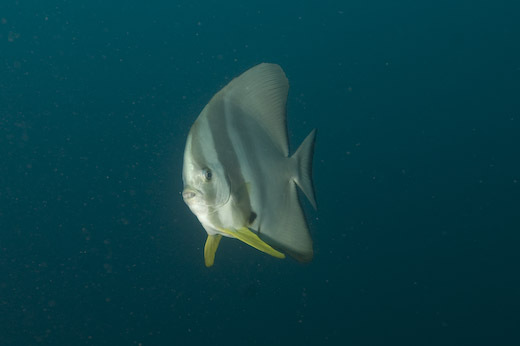 This was my first visit to the Maldives and certainly I am keen to see more of the diving here. 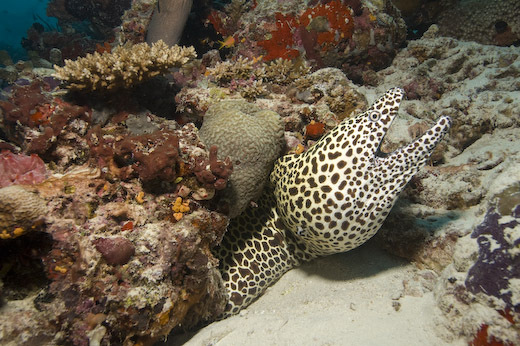 I have subsequently found out that the diving in the far south of the Maldives around Equator Village is meant to excellent, and it’s one of the few places where soft corals can still be found in abundance since coral bleaching damaged much of the Maldives dive sites. The only major drawback to the Maldives is the expense – accommodation and food are not cheap due to everything having to be imported and the government’s interest in only attracting “quality” (i.e. rich) tourists. Liveaboards make this more managable, but even so, it’s pricey. 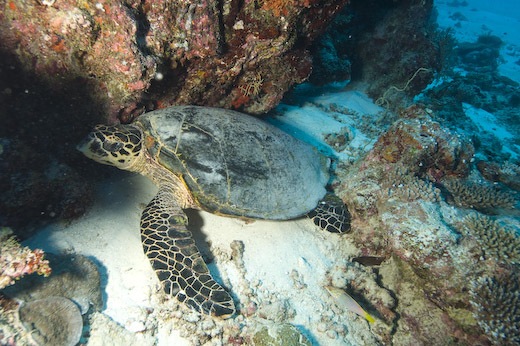 The diving: There are a lot of different dive sites around Bandos. 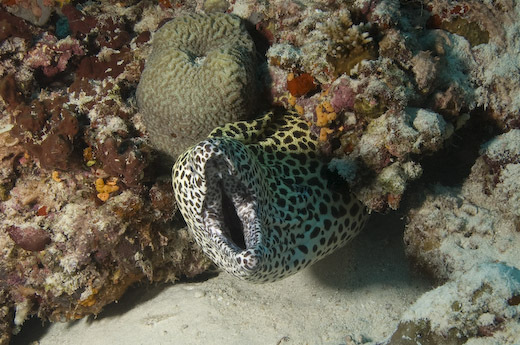 During a full week of diving there, we only visited the same sites once, and that was because I made a special request. 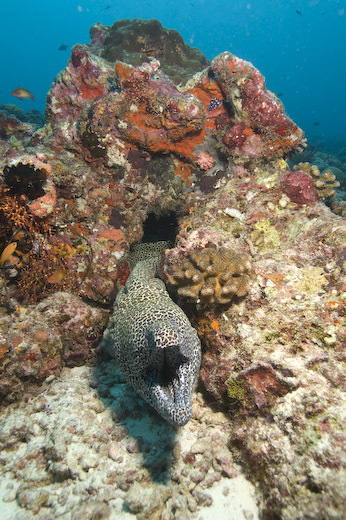 The topography is quite similar on most dives, as you’d expect on island reefs – a sloping reef of mainly hard corals that is intermittently broken up by sand, usually no deeper than 30 metres. There is a fairly intact cargo wreck over right by Male Airport too, but that’s about the only one in the vicinity. Visibility is generally very good and gives the sites a picture postcard quality. 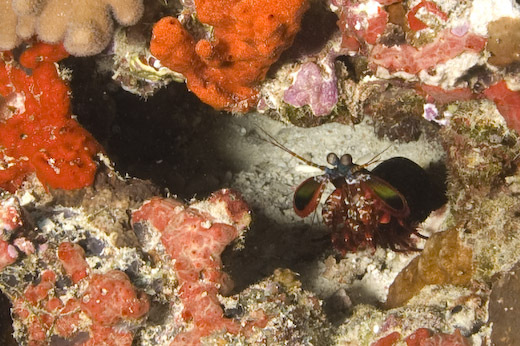 Some dive sites have fantastic overhangs with coral fans underneath. 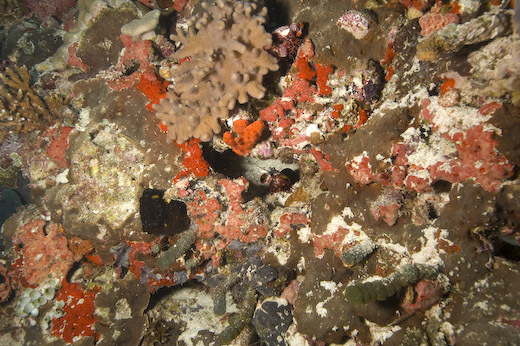 The hard corals look quite gnarled in places but also have patches of explosive colour too – soft corals are noticable by their absence. Each site has its own merits and it’s difficult to recommend particular sites over others, given most of them are within 20 minutes boat ride. 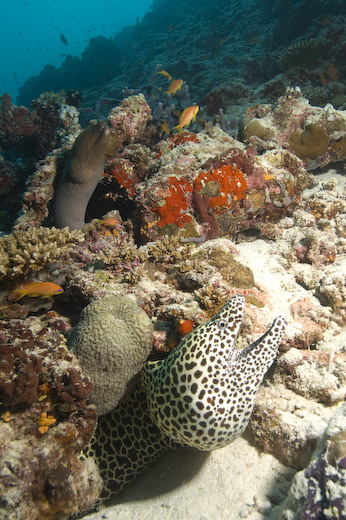 However, it’s the marine life that really makes the Maldives. 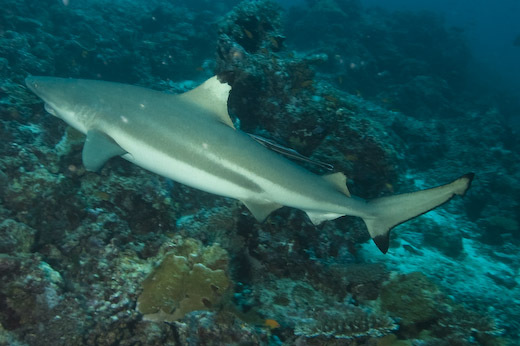 There are scores of tropical fish species, with great big schools of yellow snapper and seemingly endless clouds of blue triggerfish hovering over the reefs, while blacktip reef sharks patrol the deeper depths and six foot long moray eels of all colours – some the size of a tree trunk – are to be seen on virtually every dive. The star attraction around Bandos are the manta rays that gather en masse during September and October for mating season. They can be often seen throughout April to December. I visited out of season, but still got to see mantas twice, at Hudhuveli Out and on Lankan Reef, where the main cleaning station is located. Seeing a manta when you’e not expecting it is easily one of the Top 5 Dive Experiences. At Hudhuveli Out we were on our safety stop when two mantas sped past us, while at Lankan Reef, we’d passed by the empty cleaning station a minute or so before and I idly looked back behind me, only to see a manta mother and child glide into the station very gently and very slowly. They circled around us and then decided to disappear back into the blue, no doubt being protective. 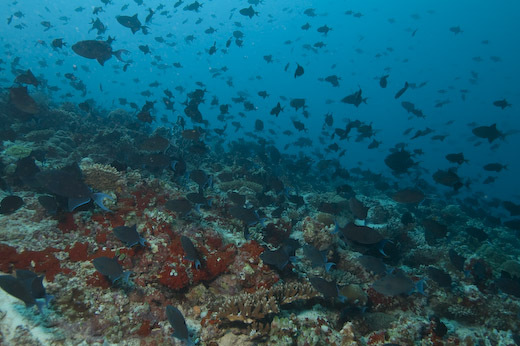 The house reef on Bandos is worth repeated dives as well. 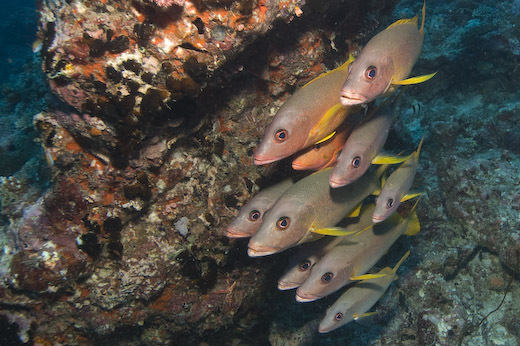 Divers can gear up in a small sandy bottomed lagoon and then swim through a channel out onto the reef proper, following a guiderope. The house reef has quite a few blacktip sharks that are not particularly shy, especially when you’re going in and out of the channel! 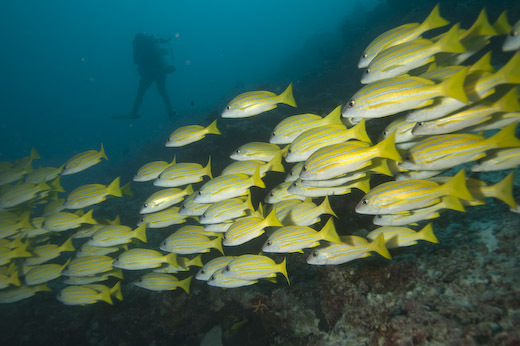 Big schools of yellow snapper can also be found here. 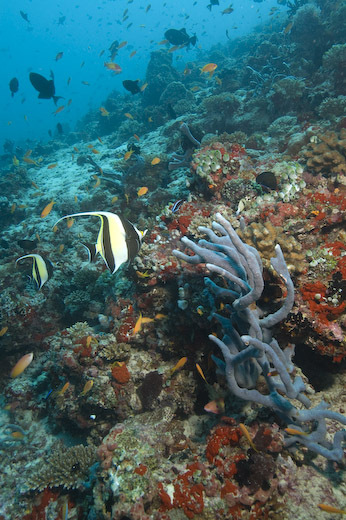 The house reef itself is a steep slope that bottoms out at around 25 metres. This is the site used for night diving. The Dive Shop: Bandos’ Dive Centre is a big, well-equipped operation with several instructors. Customers are a real mix of nationalities and dive abilities. If you are a single diver like me, you will be buddied up with another diver. The majority of Bandos divers are either beginners or casual divers who are certified but have not dived for several years. The Boats: traditional Maldivian dhoni kitted out for diving. The boats offer 2 dives in the morning and one in the afternoon except on Fridays, where it’s only 1 dive in the morning so the boat staff can back to the mosque for prayers. No camera facilities at all – if you have a big rig, you’ll need to keep it on your lap as it can get choppy at times and dhonis roll with it. Customers are divided into Guided and Unguided – typically any diver who is Advanced Open Water or above is buddied up and sent off on their own, with OW divers guided by the dive staff. You can come up wherever you want and the boat will collect you. 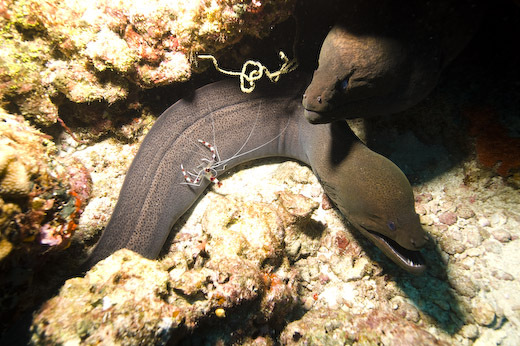 Currents: the dive sites around Bandos have occasionally strong currents. Dive staff always jump in and check the current first before divers enter the water, but as is the nature with currents, what it’s doing on the surface is not a guarantee of what’s happening at 20 metres. All divers must use computers and safety sausages (SMBs). Food: Only a small bottle of water and an apple or orange are available on the boat – if you want more food for your surface interval, bring your own. Nitrox: Bandos’s Dive Shop offers free Nitrox as standard, which is greatly recommended. 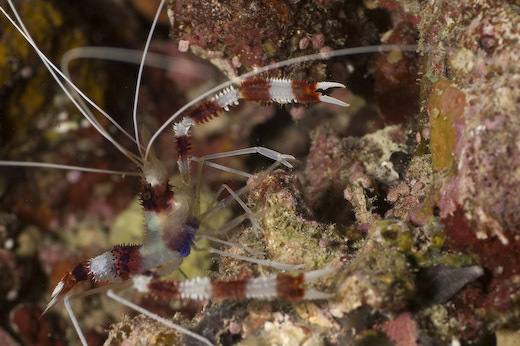 When To Go: You can dive all year round at Bandos. The rainy season is from May to October and there can be bad weather during this period. However, there is also a monsoon season from January to March and certainly while I was there iat the end of March it rained for 4 out of the 7 days. The manta season is from April to December – it’s not guaranteed you will see mantas, but there is a very good chance of doing so. 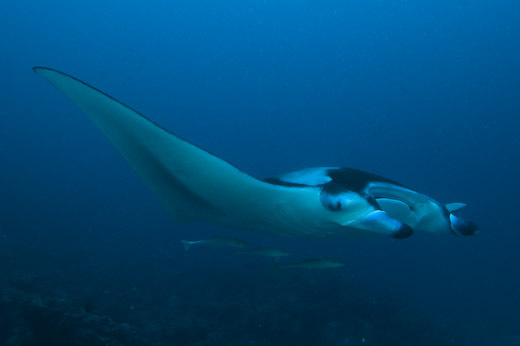 During manta season in September and October it’s not uncommon to see numerous mantas on one dive. While I was there, in March, we still saw mantas on two occasions even though it was off-season. Temperature: Hot! Around 30 degrees Celsius in the water and on land. The Resort In General: I was staying at Bandos with my friends Ayesha and Wilco who were working there as dive instructors (they have now moved on after completing their one year contract). Therefore I didn’t get to see the resort’s range of rooms really, although there is a wide selection of accommodation and it’s all pretty luxurious. Bandos caters for a wide clientele and is very kid friendly – if you are looking for a romantic Maldives holiday, this is probably not the place to come. (Somewhere like Karumba might be a better bet). More info: I recommend Lonely Planet Maldives as a good overview of the country and guide to choosing a resort suited to what you want. The book features a lot about diving, although sadly the dedicated Lonely Planet Maldives Diving and Snorkelling has now been discontinued.